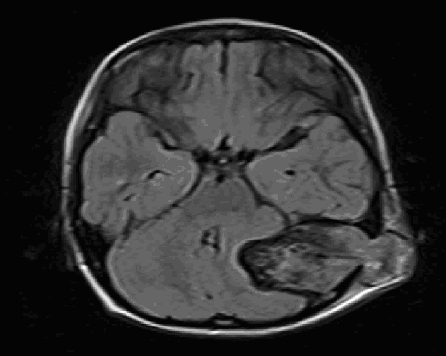 Primary CNS angiosarcoma is an extremely rare disease with extremely poor overall prognosis. The majority of the few cases reported in the literature discuss lesions arising from the scalp or calvarium. Meningeal angiosarcoma is rarely reported. Here we describe a case of primary meningeal angiosarcoma in a 13-year-old boy with intra- and extracranial extension with emphasis on the CT, MR, and angiographic imaging features. 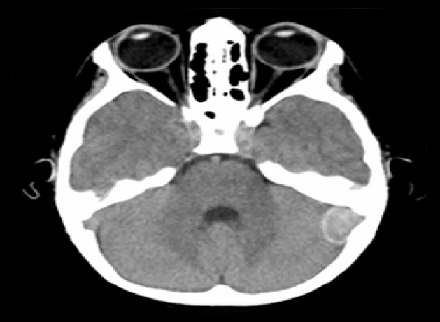 A previously healthy 13-year-old boy presented with a mild headache. Unenhanced head CT demonstrated a hyperdense dural-based mass overlying the left cerebellar convexity resembling a meningioma. The underlying left occipital bone was normal without evidence of erosion or hyperostosis (Figure1). Although the patient was scheduled for a brain MRI next day, the child was lost to follow-up. 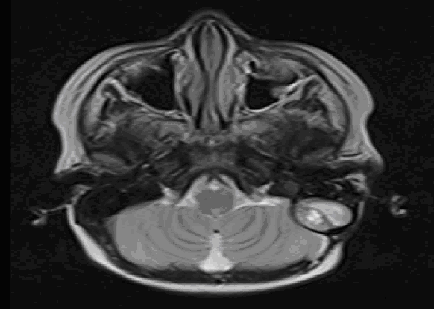 The patient re-presented seven months later with a large growing retroauricular mass, dizziness, and ataxia. Unenhanced CT showed a large hyperdense left occipital extraaxial mass, significantly increased in size since the previous CT, with extension into the left postauricular space through a left occipital bone defect. The mass caused erosion of the left temporal bone, without hyperostosis (Fig. 2a-b). An MRI of the brain demonstrated a well-defined dumbbell-shaped intra- and extracranial mass with heterogeneous internal signal, T2 hypointense capsule, and moderate heterogeneous enhancement after intravenous contrast administration. Internal T1 and T2 hyperintense signal with corresponding susceptibility artifact on gradient echo sequences was consistent with internal hemorrhage. There were prominent serpentine and tubular flow voids, indicating high vascularity with enlarged vessels. 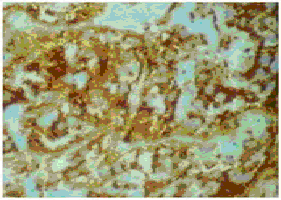 There was no associated diffusion restriction. The mass showed mass effect on adjacent structures compressing the left cerebellar hemisphere medially, the left occipital lobe superiorly the fourth ventricle was partially effaced, without evidence of frank invasion. No surrounding edema was seen. The mass invaded the left sigmoid sinus inferiorly and extended through a bony defect in the left occipital bone into the left post auricular scalp (Fig. 2a-f). Conventional catheter angiogram confirmed a highly vascular mass and arteriovenous shunting with feeding branches arising from the left external carotid artery branches, including the left occipital, posterior auricular, and middle meningeal arteries (Figure 2g). 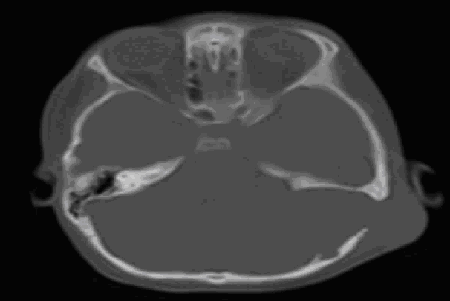 mass in the left posterior fossa (arrow), overlying the left cerebellar convexity. (b)	CT image in bone window showed neither hyperostosis nor bone erosion. Fig. 1 :( A&B): A 13-year-old-boy with headache. Left internal carotid artery angiogram was normal. There were no additional brain lesions or metastases on dedicated imaging of the body and spine. The patient underwent two debulking surgeries. Given the sigmoid sinus invasion, there was subtotal resection of the tumor. In the most recent MRI two years after the first presentation; there was a 3 x 2 cm residual tumor (Figure 2h). The patient underwent radiotherapy. of the left temporal bone. tubular flow voids indicating high vascularity (arrow). signal within the mass, suggesting blood products (arrow). 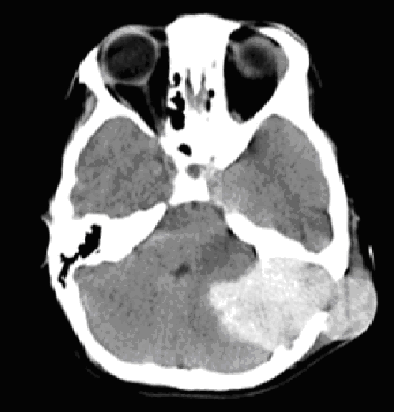 mass effect, without significant edema in the adjacent brain parenchyma. left occipital, posterior auricular, and middle meningeal arteries. shows a small residual tumor. the tumor cells for CD31. 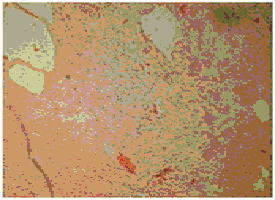 Fig 3 :( A, B&C) Histopathology of the resected tumor. Soft tissue sarcomas are rare tumors that constitute only 1% of all human malignancies (3). Even rarer are angiosarcoma, malignant tumors that comprise less than 2% of all soft tissue sarcomas in adults (4) and 0.3% in children. (5) In the adult population, these tumors most commonly arise in the skin, breast, liver, and deep tissues,(6) and in children, they most often arise from the mediastinum, pericardium and heart. (7) Meningeal sarcomas are rare, aggressive tumors affecting children more often than adults. The current literature suggests that this tumor presents predominantly as a pediatric disease. A literature review of CNS angiosarcomas done by La Corte et al. (2) showed that there were four age specified cases of meningeal angiosarcoma in the last 40 years, three of them were children. Even so, primary meningeal tumors occur rarely in children, comprising 0.7-4.3 % of intracranial tumors in childhood. (8) Although histopathology and immunohistochemistry are necessary for definitive diagnosis, imaging evaluation with MRI and CT enables visualization of the origin and extent of the tumor, and evaluates meningeal involvement. All malignant mesenchymal tumors share a roughly common imaging pattern of highly aggressive dural, skull, skull base, scalp lesions invading locally, with amorphous ill-defined rapidly enlarging mass, often with both intra- and extra axial components (2). In our patient, the extraaxial dural-based lesion with normal adjacent occipital bone seen on the initial CT was highly suggestive of a tumor of meningeal origin. The rapid enlargement of the tumor with calvarial destruction and extra cranial extension over a short period of time indicated a highly aggressive malignant process. The MRI demonstrated a heterogeneous, moderately enhancing mass with hemorrhagic components and invasion into the left sigmoid and transverse sinuses. 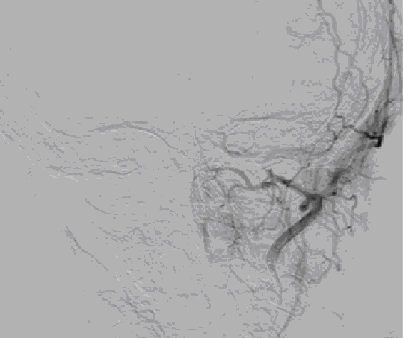 Flow voids within the lesion seen on MRI suggested a highly vascular lesion with arteriovenous shunting, confirmed by selective left external carotid artery angiogram. Differential considerations arehemangiopericytoma, metastasis, and malignant meningioma. Meningeal angiosarcoma and malignant meningioma may appear similar and share many imaging features including dural-based location, heterogeneous enhancement, adjacent bone destruction and local invasion. 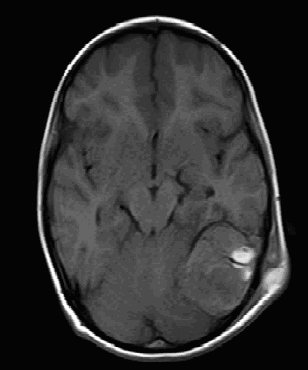 However, malignant meningiomas tend to occur in the adult age group and exhibit more marked adjacent peritumoral edema. Internal hemorrhage favors meningeal angiosarcoma. Recent studies have shown that malignant meningioma display lower apparent diffusion coefficient (ADC) values than their benign counterparts (9), a feature not seen in meningeal angiosarcoma. 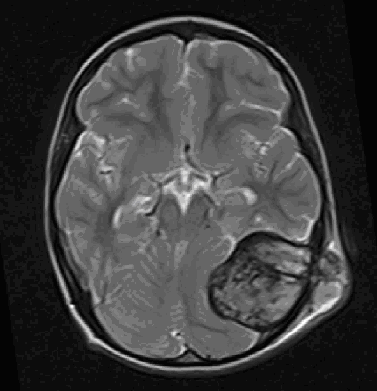 Current evidence suggests that meningeal angiosarcoma presents predominantly as a pediatric disease. 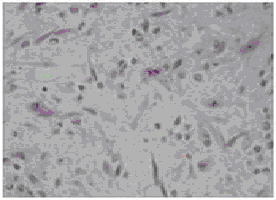 Although histopathology is necessary for definitive diagnosis, angiosarcoma has several distinguishing imaging features that can suggest the diagnosis. 2.Emanuele La Corte1 , Francesco Acerbi1, Marco Schiariti1, Morgan Broggi1, Emanuela Maderna2,Bianca Pollo2, Raffaele Nunziata2, Elio Maccagnano and Paolo Ferroli.primary central nervous system angiosarcoma :a case report and literature view, neuropathology 2015;35,184-191. 4.Lezama-del Valle P, Gerald WL, Tsai J, Meyers P, La Quaglia MP. Malignant vascular tumors in young patients. Cancer. 1998; 83:1634–9. 5 .Ferrari A, Casanova M, Bisogno G, Cecchetto G, Meazza C, Gandola L, et al. Malignant vascular tumors in children and adolescents: A report from the Italian and German Soft Tissue Sarcoma Cooperative Group. Med Pediatric Oncol.2002; 39:109–14. 6. Meis-Kindblom JM, Kindblom LG. Angiosarcoma of soft tissue: a study of 80 cases. Am J SurgPathol 1988; 22 (6): 683–697. 7.Renukaswamy GM, Boardman SJ, Sebire NJ, Hartley BE. 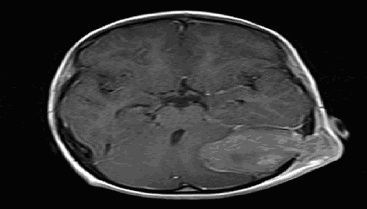 Angiosarcoma of skull base in a 1-year-old child: a case report. 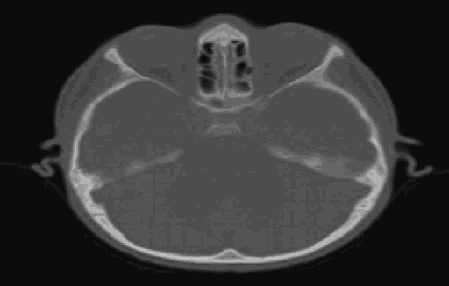 Int J Pediatric Otorhinolaryngolgy.2009; 73:1598–600. 8.Reusche E, Rickels E, Reale E (1990) Primary intracerebral sarcoma in childhood: case report with electron-microscope study. J Neurology 237: 382–384. 9.V.A. Nagara, J.R. Yea, W.H. Ngb, Y.H. Chanc, F. Huia, C.K. Leeband C.C.T. Lima, Diffusion-Weighted MR Imaging: Diagnosing Atypical or Malignant Meningiomas and Detecting Tumor Dedifferentiation, AJNR June 2008; 29: 1147-1152.